It’s summer, which means we have to drink as much rosé as we can before the local wine stores focus their stocking on reds and fall whites. While summer is coming to a close, our love of rosé continues to go strong. We’ve tried over a dozen fantastic rosés this summer, but have selected our top five in case you don’t have the time (or funds!) to sample our full list. In order from enjoyed-a-try to bought-three-bottles, here are our top rosés of summer 2017! A delightful light wine for the hottest summer days, Gris de Gris holds subtle flavors of grapefruit. Sweet with a citrus edge, this rosé is a crisp, cool, light-bodied pink wine that pairs perfectly with a sweltering day and light meal. Can you tell we like grapefruit rosés? This wine holds similar grapefruit and citrus flavors to the previous wine, but with more of a fruity flavor. With light strawberry flavor, the wine has a gentle edge of sweetness on Gris de Gris. The wine also has a unique grassy nose; if you close your eyes, you can imagine yourself in the winery’s field, sipping the light wine on a warm summer day. 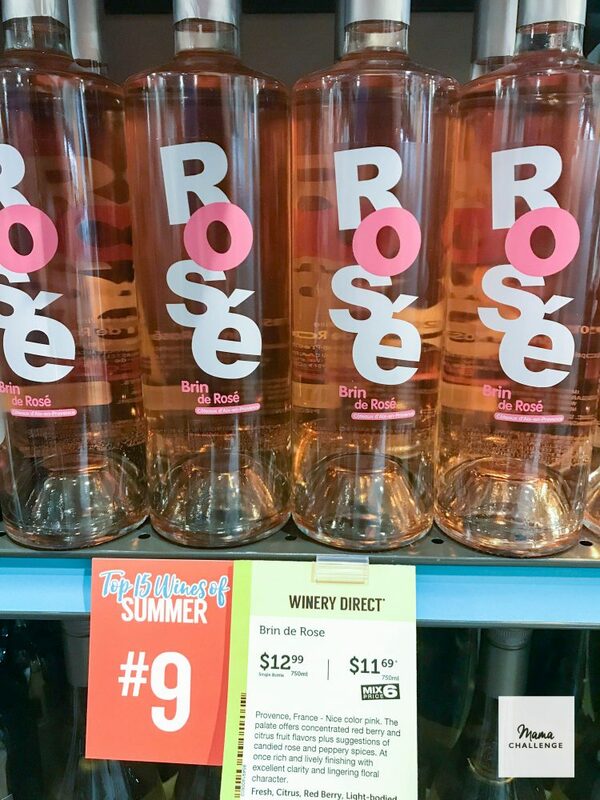 Want a little more flavor and depth to your rosé? Or are you a fan of Malbec? We have the rosé for you! This wine packs a little more body and flavor, with ripe berry flavors. And to make things better, it’s less than $10 at Total Wines! Simple in name and taste, this is a perfect crowd-pleaser for a sunny patio day. It’s light and gentle on the tongue in the way only a French wine can be, but with enough character to make you pour another glass (and another…and another). Not to mention, we love the bottle – it’s original shape sets it apart from traditional rosés and gives it a modern and fun non-traditional flair. This is the rosé we keep coming back for again…and again…and again. The one we check is still in stock, like, weekly. Because how is no one else on to this yet? With sweet berry flavors cut by the minerally aftermath of natural tanins, this dry rosé is perfect with anything. Especially an empty wine glass! Perfect for wine-lovers and newcomers alike, we recommend snagging a bottle before the season is up! Cava’s Little Sister, Summer White! Avinyó’s Petillant white wine is produced in Catalonia Spain, with 80% Petit Grain Muscat and 20% Macabeu grapes. After being fermented in stainless steel tanks, the wine is given its light bubbles from the Charmat Method (tank method) in a secondary tank. Why is it Catalonia’s summer drink of choice? Probably because it’s everything you need from a summer white. Crisp, lightly acidic, blooming with lychee and green apple flavors, floral, with tiny almost metallic bubbles that are a match made in heaven for summer seafood pairings – as if the tiny silver fishes on the label didn’t give it away. If you happen to come across any petillant or vi d’agulla wines in your travels this summer PLEASE take the opportunity to taste them ice cold with all your summer food choices. Elephant brothers, Petite Sirah (a red grape) and Petit Verdot (normally a French blending red grape), completely steal the show in this circus themed wine from Michael David Winery. As you may remember, we at Half-Past already fell in love with this winery’s Seven Deadly Zins – and their Petite Petit red blend was one for the record books. Get ready to be entertained by this dark purple wine. This bottle is the definition of jammy. It’s silky smooth with almost creamy tannins and a slightly gamey finish (no doubt thanks to the 16 months it spends in French Oak barrels). The wine is juicy in the front, smokey in the back, boasting straight up plum flavor with currant ripeness. Petite Petit has a bold and luscious full body with a hint of spice. Dear Red lovers, If you have never tried Petite Sirah or Petit Verdot we highly recommend you taste this wine; however, make sure you are not in public! The wine won’t be the only elephant in the room: after one glass of this wine, your friends will wonder how to politely ask you to brush your teeth. The pictures don’t do it justice. Enjoy the circus! Let us know what you thought!